The “Yandex.Disk” app lets you manage your Disk files on your computer and automatically syncs them with Disk over the internet. 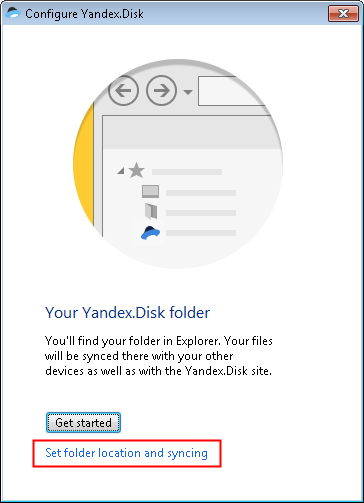 There isn't enough space on the computer for the whole Yandex.Disk folder. What should we do? 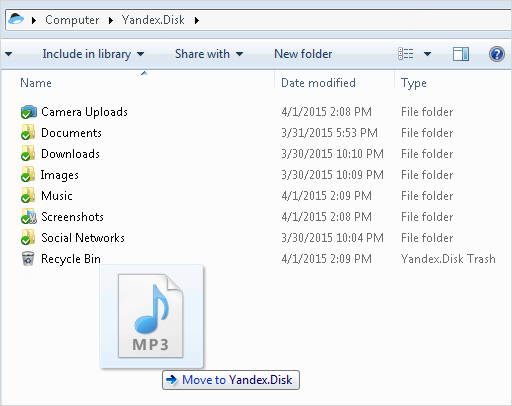 How can I put the Yandex.Disk icon in the system tray? Download the app from disk.yandex.com/download. You will see instructions on how to run the file once it starts downloading. The icon will appear in the Windows system tray when the installation is complete. 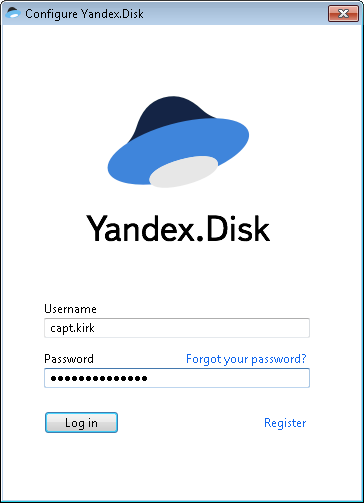 Once installed, the “Yandex.Disk” app will ask you to enter your Yandex username and password. The tray icon will display an exclamation mark until you've logged in. If you did not log in immediately after installation, click the app icon in the tray and the following link: Disk is not set up. Configure Yandex.Disk. If you still haven't registered on Yandex, click on Register to sign up. Then enter your username and password in the program. Attention. If you use two-factor authentication, you will need a one-time password, which is generated by the “Yandex.Key” app, to log in to Yandex.Disk. The “Yandex.Disk” app automatically creates a folder that syncs with our cloud service. You can customize its location on your computer after the app finishes installing. To do so, click on Set folder location and syncing → Change and select the location you want for the Yandex.Disk folder. Note. If your computer does not have enough space for the entire Yandex.Disk folder, the app will warn you. 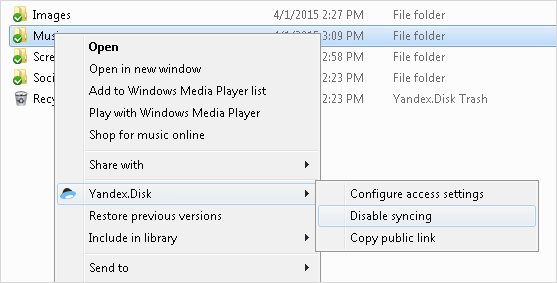 You can set up selective synchronization or choose another folder for the Disk files. In the Other tab in the Folder block, click the Edit button. 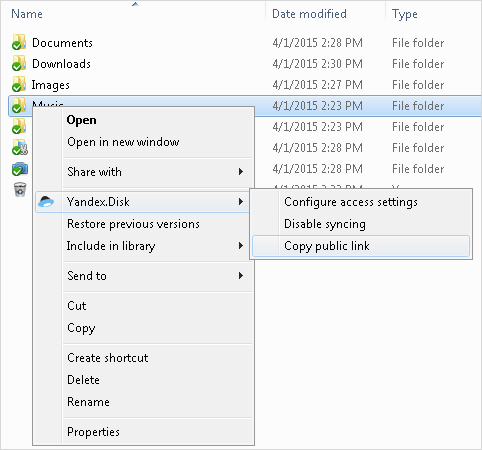 All you have to do to upload files to Disk is to copy or move them to your Yandex.Disk folder. For example, you can open the folder in Explorer (click in the app menu) and drag the files you want to it. 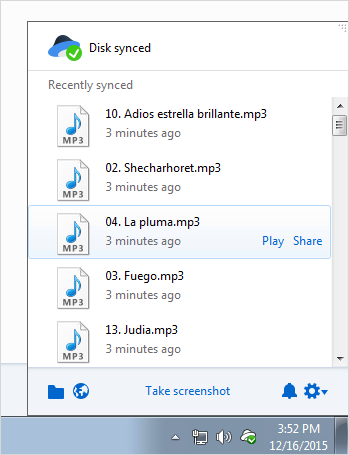 The files will then be synced automatically. You can open your Disk page to make sure that all the files have been uploaded successfully. The latest synchronized files and folders can be found in the app menu. 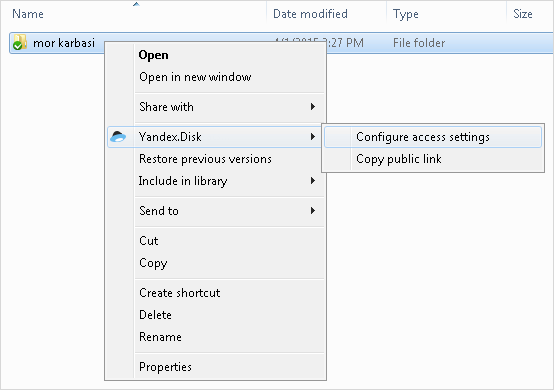 You do not need to open the Yandex.Disk folder to use them. You can quickly open a file from the menu, share it, drag it to the window of the program you want to open it in, or delete it. Any file you delete from the Yandex.Disk folder will be moved to the Trash folder on the server. These files are stored in the Trash for 30 days, after which they are automatically removed from the server. Once removed from the server, these files cannot be restored. Note. Files in your Trash count towards your storage allowance. Empty your Trash if you're running out of space. To empty the Trash on the Disk, open the Yandex.Disk folder, right-click the Trash and choose the Yandex.Disk: Empty Trash entry. 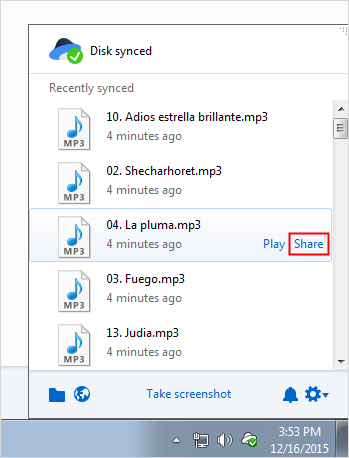 You can share any file or folder on your computer. If you select a file or folder that hasn't yet been uploaded to Disk, the app will automatically upload it to the Disk server and copy the public link to your clipboard. Right click on the file or folder. In the menu that appears, choose Yandex.Disk → Yandex.Disk: Copy public link for a folder, or Yandex.Disk: Copy public link for a file. Click the Disk icon in the tray (notifications area). You can insert the copied link in an email, post it on social networks, and so on. Note. You can only share the latest synchronized files. 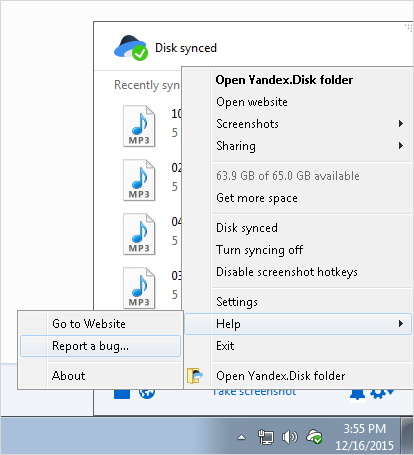 Open the Yandex.Disk folder and right click on a folder. In the menu that appears, choose Yandex.Disk: Access settings. The app opens the access rights page in your browser. On this page, you can choose people to grant access to, and set their access rights. You can automatically upload all your photos and videos from any storage or mobile device (camera, smartphone, memory card, etc.) and save them in the “Camera Uploads” folder or any other folder in Yandex.Disk. To start the upload of photo and video files on Disk, click the Upload button. Leave the Always upload photos and videos from <device name> checkbox selected to start the upload automatically when you connect the device. By default, all the photos and videos detected on your device will be uploaded to the “Photo Uploads” folder. All the files in your folder will be named according to the date and time they were taken. The image viewer lets you easily manage your photos on your computer or on the Yandex.Disk page. Note. 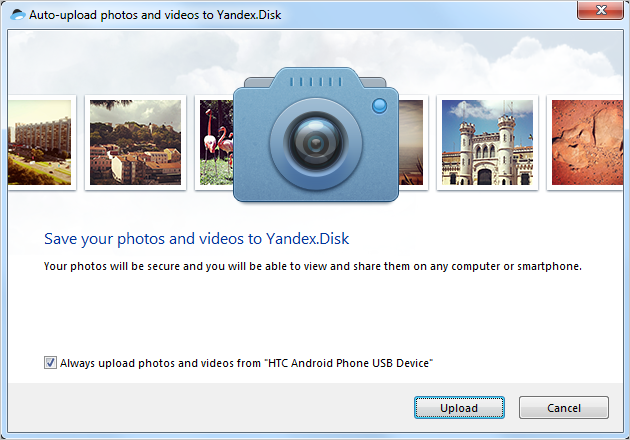 If you have already configured auto-uploads for this device in the Android app, iOS or Mac OS apps, the Windows Yandex.Disk app will simply auto-upload your new photos and videos. If the device was disconnected from the computer during the upload and the Always upload photos and videos from <device name> option was turned on, the upload will continue automatically when the connection is back. If the option was disabled, a dialog box will appear prompting automatic downloading. Just click Yes to stop automatically uploading photos and videos from your device. In the dialog box that appears, you can choose to stop only the current upload, or enable the Never upload from this device option. If you use this option, this window will not appear the next time you connect this device to your computer. Note. Automatic photo and video uploads will even work if you're not connected to the internet when you connect your device to your computer. The files on your device will still be uploaded to the "Camera Uploads" folder on your computer. Your “Camera Uploads” folder will then be synced with the Yandex.Disk servers the next time you connect to the internet. Disconnect the devices in question from your computer. Click the app icon in the Windows notifications area. Go to the Camera Uploads tab. Disable the Ask to upload photos and videos automatically option. If you no longer want files to auto-upload from a device that you had previously connected to your computer, make sure the Ask to upload photos and videos automatically option is enabled and click the Forget all devices button. The next time you connect that device, a dialog box will ask you if you want to upload your files automatically. 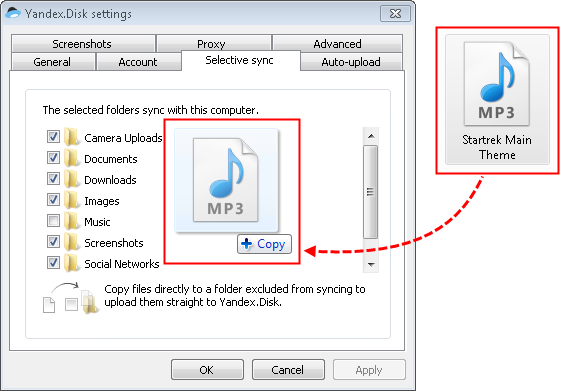 To save space on your computer, you can disable syncing of one or more folders with the Yandex.Disk server. You can also set up selective synchronization the first time you launch the app to avoid downloading all the folders to your computer. Attention. 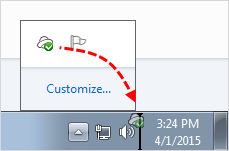 Folder synchronization cannot be turned off if not all the files in the folder have been synchronized (indicated by the icon). Click the program icon in the tray. Go to the Selective sync tab. Uncheck the folder that you don't want to sync. Click Delete folders from this computer in the window that appears for the changes to take effect. Choose the following menu item: Help → Report a bug. Please attach logs from the .sync folder and Application Data to your message. Select a topic from the Help menu. Hold down the Ctrl key and click Report an error to Yandex. A folder containing the ZIP archive you selected opens automatically. Attach this archive to the feedback form. Open the Finder, copy the address %LOCALAPPDATA%\Yandex\Yandex.Disk and insert it into the address bar. Archive the contents of the folder that opens and attach this file to the feedback form. Open the Finder, copy the address %USERPROFILE%\Local Settings\Application Data\Yandex\Yandex.Disk and insert it into the address bar.